Originally introduced and popularised by the American mathematician John Wilder Tukey, a Box Plot (also known as a Box and Whisker Plot) is a type of chart ideal for visually communicating the distribution of numerical data through their quartiles and their averages. 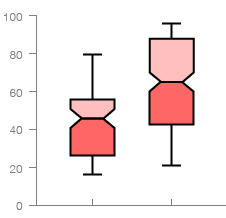 While I’ve already covered Box Plots and its variation, the Violin Plot on the main part of the site, I want to touch on the other Box Plot variations in this post. One of the original constraints on the boxplot was that it was designed to be computed and drawn by hand. As every statistician now has a computer on their desk, this constraint can be relaxed, allowing variations of the boxplot that are substantially more complex. These variations attempt to display more information about the distribution, maintaining the compact size of the boxplot, but bringing in the richer distributional summary of the histogram or density plot. These plots can overcome problems in the original such as the failure to display multi-modality, or the excessive number of “outliers” when n is large. Works the same as a standard Box Plot, but uses the width of the box to represent the size of the data within each group (each data series). So a group with a larger total in the data will have a larger width. Making the box width proportional to the square root of the size of the group is a popular practice with this chart. 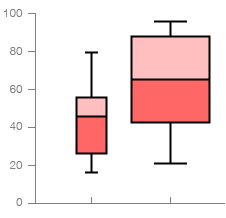 Again, works the same as a standard Box Plot, but has a narrowing of the box around the median value. This acts a handy visual guide to help read and compare the differences between the median values across each data series. As the name states, this variation combines both attributes of the last two Box Plot variations listed. The first variation to display a density estimate was the vase plot (Benjamini, 1988), where the box is replaced with a symmetrical display of estimated density. 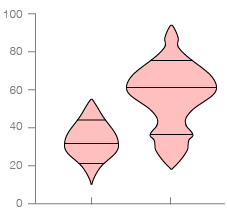 Violin plots (Hintze and Nelson, 1998) are very similar, but display the density for all data points, not just the middle half. 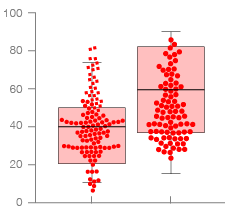 […] a one-dimensional scatter plot which is like “stripchart”, but with closely-packed, non-overlapping points; the positions of the points are corresponding to the frequency in a similar way as the violin-plot. The plot can be superimposed with a boxplot to give a very rich description of the underlaying distribution. 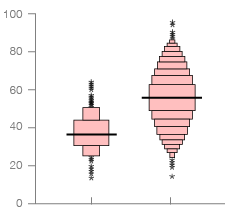 The highest density region (HDR) boxplot (Hyndman, 1996) is a compromise between a boxplot and a density boxplot. It uses a density estimate but shows only two regions of highest density: the top 50% and 99%. These regions do not need to be contiguous and make it easy to spot multi-modality. The disadvantage of HDR boxplots is a less-sophisticated definition of extremes, making the outliers less useful for non-normal data. Figure 6 shows the HDR boxplot for the four distributions previously described. 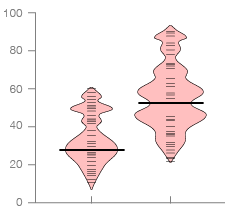 This variation is similar to a Violin Plot but with the graphical markers inside the middle of the density shape removed. 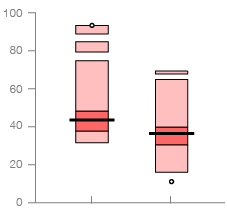 Instead, a Box-Percentile Plots use line markers to indicate where the median, upper and lower quartiles occur. The letter-value boxplot (Hofmann et al., 2006) was designed to overcome the shortcomings of the boxplot for large data. For large datasets (n 10, 000), the boxplot displays many outliers, and doesn’t take advantage of the more reliable estimates of tail behaviour. 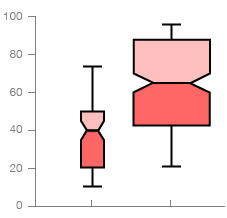 The letter-value boxplot extends the boxplot with additional letter-values apart from the median (M) and fourths (F): eigths (E), sixteenths (D), …, until the estimation error becomes too large. All of these charts are one-dimensional. 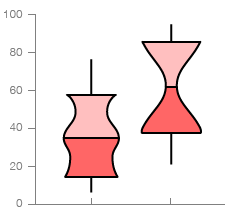 When doing the research into Box Plot variations, I discovered that there are in-fact two-dimensional and multiple-dimensional Box Plot variations, which I plan to cover in a future post.